Also, check out a few additional fun things going on for the launch here. I have to agree with the lash curler! I’m so glad they’re making a Canadian e-commerce site!! I was so sad when their items were pulled out from Sephora, although strangely I was able to buy a shu uemura eyelash curler just last year at Sephora… old stock maybe? Favourite item(s): Eyelash curler and facial mist. I love their cleaning oil, it’s a must for my daily routine. Thats so exciting that they’re finally getting a Canadian site!! 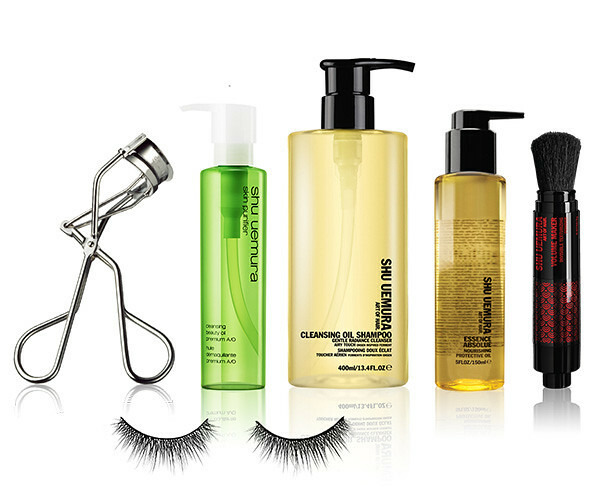 I’ve heard so many good things about Shu Uemura so I’m really excited that they finally have a Canadian site. I’ve always wanted to try their eyelash curler. Eyelash Curler without a doubt! It’s been part of my daily routine for almost a decade. I love their curler as well. Their eyelash curler is my absolute favourite! Perfecly curled lashes everytime! Love that this one comes with a cute little charm! I managed to pick up an extra curler when I was in Hong Kong for a mere $12! Thanks for hosting such an awesome giveaway. I’ve heard so many good things about this curler and would love a chance to try it!! I love Shu too!! I’ve been trying to get my hands on their uv mousse but it’s always sold out. SUPER regret not buying it at the Seoul Duty Free shop. I’ve been wanting to try this eyelash curler for the longest time. Hi there! Thank you for sharing this wonderful news. As for me, I would love to win the very thing that everyone is raving about here: the eyelash curler! I love this lip gloss and would love to win! Wow! Great contest and I’m pretty excited about the new Canadian website! I too would love to win the eyelash curler. Also the Shu Uemura eyelash curler! I would love to get the blush in soft pink! thanks for holding this wonderful giveaway! I tried a sample of Shu’s cleansing oil many years ago and fell in LOVE! Hi Jen! I definitely have to agree that the eyelash curler is my favourite item! I’ve been using it for the past 4 years! Thanks Jen for sharing this with us. Shu is kinda hard to find in Toronto. They only have 4 places. Hands down, the eyelash curler. Its been in my repertoire for years! Their eyelash curler is definitely the best! I broke my old one and recently got the karl lagerfield collaboration version. Definitely the eyelash curler (http://www.shuuemura-usa.com/product/EYELASH-CURLER,default,pd.html#start=1&cgid=accessories-eyelash-curlers)! Love this, thanks for the giveaway! LOVE LOVE the eyelash curler! I’m so sad that they stopped selling Shu Uemura products at my local Nordstrom! I’d love one of their classic eyelash curlers! Have always heard great things about their cleansing oils! Have always wanted to try the iconic eyelash curler! I have to agree, their eyelash curler is the best! I’ve been using it for years too. Thanks for having this lovely giveaway! :) I’d love to try the moisturiser, I still haven’t found one that works for me, this could be the one! I have also been using the eyelash curler for years. It’s been really effective in curling my eyelashes. I heard much good things about the “Essence absolue” to protect the hair. I would love to get my hands on it with this 100$-prize! not to mention that the product container is so playful and fun! I prefer the Shiseido eye lash curler because it fits the curvature of my eye better, but Shu Uemura products are AMAZE! What a great giveaway! I really love it! Thank you. Sounds like exactly what I was looking for! Exfoliator AND whitening! Fresh fresh fresh! I’d love to try this: http://www.shuuemura-usa.com/product/DEPSEA-HYDRABILITY-MOISTURIZING-LOTION,default,pd.html. Thanks for doing the giveaway! Of course the easy answer is the eyelash curler! I think this is the only one I’ve found that works wonders on my straight, short, stubby lashes! I love reading your blog!! Keep up the great work! I have wanted one of their eyelash curlers for years but could never justify it on a student budget! Thanks for a great giveaway! I’ve heard so many great things about their cleansing oils! Want!! http://www.shuuemura.ca/product/cleansing-beauty-oil-premium-a-o-advanced-formula,default,pd.html#start=12&cgid=skincare-cleanser-remover their cleansing oil is my favourite! thanks! I, like everyone, have always wanted the eyelash curler. I agree with you – my favorite is the eyelash curler! I don’t know what I would do without it – definitely brightens up my eyes! I would love to get my hand on that eyelash curler! i would love to have the eyelash curler ! my favourite item is the eyelash curler! i can’t wait to get a second one – one for my on-the-go makeup bag, and one for home! would love to try the eyelash curler! Totally agree with the lash curler! I love the eyelash curler the most! Hey Jen! I’d have to say that the eye lash curler is by far my favourite product. I recently attended a professional makeup tutorial and the artist swears by this product, saying that she’s waiting for the day when other products (Sally Hansen, Revlon, etc.) will finally figure out that the rubber part of the curler is rounded to prevent it from breaking after frequent use. Love reading your posts by the way! Just got the eyelash curler and love it! Their cleansing oil is my HG! my short lashes need some help! I’d love to try their cleansing oils! This is want I want from Shu Uemera: White efficient clear brightening gentle cleansing oil. My mantra is no amount of makeup can substitute clear looking skin! My favourite product is their eyelash curler!!! I’d love to try the eyelash curler. Thanks for having a giveaway!!! Best eyelash curler there is! Definitely have to go with the lash curler. https://www.shuuemura.ca/product/EYELASH-CURLER,default,pd.html Much ado has been made about how it’s a great for eye shapes like mine. the eyelash curler! Simply cannot be beat! I would have to say that my fave Shu product will always be their fresh cleansing oil. the eyelash curler is the best ever!!! I would love to get an eyelash curler! I have been looking for one that works well with Asian eyes so this would be the perfect tool! My favourite would have to be these false lashes! 😀 hope I get lucky! I would like to try this moisturizer! The Unmask Palette Pink Blossom Dream Collection looks amazing and so pretty! I’ve been loving the eyelash curler since I first was recommended it 5+ years ago! I recently tried their cleansing oil too, and i’m quite impressed, but I think I would really want to try the oil shampoo! I’d say that the Painting Liner Blackish Purple Satin gel liner is my favorite! I’m CRAZY about their Ultim8 cleansing oil, it Takes my makeup off effortlessly and makes my skin soft and radiant! Love their cleaning oil, it’s a must for my daily skincare routine.